BURGESS OPTIWHITE™ is a premium whiteness flash calcined extender for TiO2 exhibiting excellent GE Brightness used extensively in First Line interior/exterior flat or low sheen water based and alkyd paint systems. BURGESS OPTIWHITE™ exhibits excellent whiteness retention and hiding when embedded in coatings and polymers. Savings are produced by the strength of BURGESS OPTIWHITE™ in medium quality paint formulations. Using BURGESS OPTIWHITE™ versus using standard competitive calcined kaolin (holding the clay parts equal), allows the formulator to achieve significant reduction in TiO2 and provides significant cost savings. BURGESS OPTIWHITE™ offers excellent dispersion, high hiding, and improved film properties. 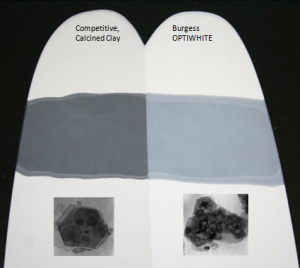 BURGESS OPTIWHITE™ may be used in combination with an ultrafine particle size hydrous clay – BURGESS NO. 28/BURGESS NO. 98 to produce a satin finish sheen paint.